Appetizers are a real challenge for me. I’m constantly looking for new things to try but tend to end up making the same few things over and over. Usually I plan the rest of the meal first and by the time I get to thinking about the appetizers I’m spent. I end up making things like roasted pepper bruschetta, grilled calamari and caprese salad. All of which are good appetizers but I make them so frequently that I'm getting kind of board. 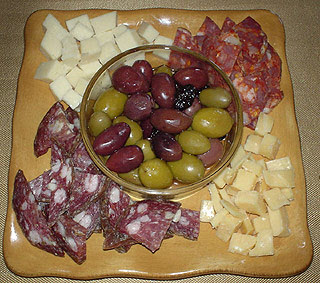 So last week, when I had a small dinner party for my mom’s birthday to plan, I was determined to come up with a new vegetable appetizer to go with my standard meat and cheese plate. 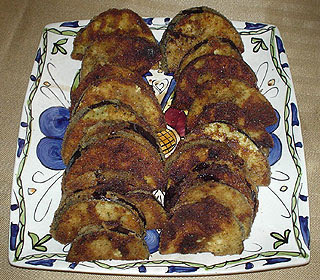 After much thought and several trips to the market to see what looked good I finally decided on two recipes: Marinated Zucchini and Fried Eggplant both found in Molto Italiano a new cookbook by Mario Batali. I know you’re probably thinking fried eggplant? Did I really need to follow a recipe for that? But this recipe is truly something special. I think the secret was the touch of butter added to the frying oil and the balsamic vinegar drizzled over the finished dish. Both appetizers were winners and now I have two more options to add to the mix. 1/4 cup olive oil 3 medium green zucchini trimmed and cut lengthwise into 1/4 inch thick slices 3 medium yellow Zucchini trimmed and cut lengthwise into 1/4 inch thick slices 6 medium cloves garlic, finely minced 2 tsp red pepper flakes 1 cup fresh basil, cut into chiffonade 2 Tbs Kosher salt 2 Tbs freshly ground black pepper 1/4 cup red wine vinegar In a deep 10 inch saute pan, heat the oil over medium heat until just smoking. 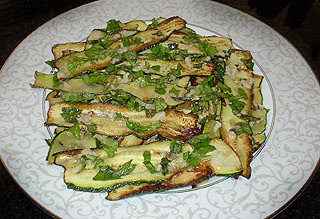 Add 5 or 6 zucchini slices and cook, turning once, until golden brown, 3 to 4 minutes. Transfer to paper towels to drain. Repeat with the remaining zucchini. In a small bowl, gently stir together the garlic, red pepper flakes, basil, salt and pepper until well mixed. Line the bottom of a deep dish pie plate with one quarter of the zucchini slices. Sprinkle evenly with one quarter of the herb mixture and drizzle with 1 tablespoon of the vinegar. Continue layering the remaining zucchini and herb mixture, with the remaining vinegar. Cover with plastic and refrigerate for 2 hours.